Strona główna » Blog » Program » An even bigger Nintendo stand in the Video Games Section! Did you have fun at the Nintendo stand at last year’s Pyrkon? This year it will be even better! Prepare yourselves for amazing experiences, as this year in the Video Games Section you will find a Nintendo Zone of over 300 square meters, packed full of consoles, where you will have the chance to play many Switch games, both the well-known ones and new ones alike! At this stand, the largest of all the stands in the hall, you will of course have the chance to play the most popular Nintendo Switch games – Super Smash Bros. Ultimate, Super Mario Party, Mario Kart 8 Deluxe and many more well-known and loved games. However, there will also be new releases available. You will be able to try your hand at Yoshi’s Crafted World, New Super Mario Bros. U Deluxe or Travis Strikes Again: No More Heroes! Volunteers will have the chance to face other participants in tournaments, where you will be able to win some truly amazing prizes. Get ready for some emotional games of Super Smash Bros. Ultimate, Mario Tennis Aces and Splatoon 2! And that’s only the beginning of what we have in stock. We will also have the fantastic Nintendo Labo zone, where you will test drive your own RC car and test all the Toy-cons from the Variety, Vehicle and Robot sets. 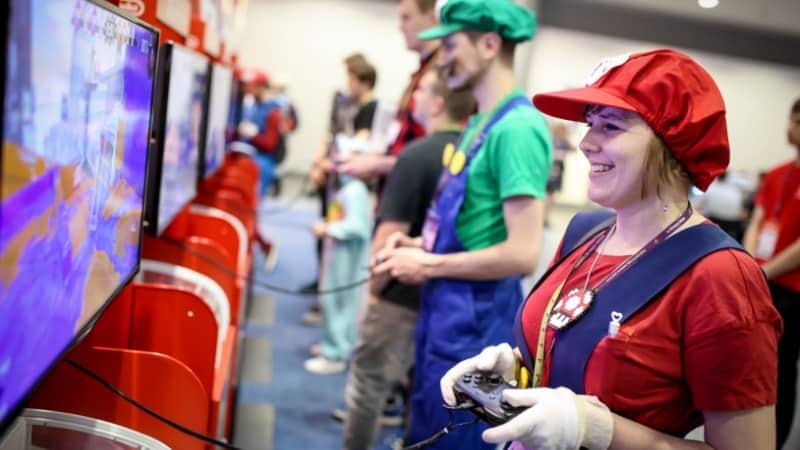 Top it up with dancing together in front of the screens, the amazing people at the stand dressed as Mario and Luigi, an entire crowd of cosplayers and a ton of positive emotions – that is what will be going at Pyrkon in the Nintendo zone. You just cannot miss it for the world!